We've all been there. Someone posts an update on Facebook, you can't think of anything meaningful to write beneath it, but just 'liking' it would convey a very different message to "I'm so sorry to hear this sad news." If only there were a 'dislike' button. It's something that's come up time and time again, and interestingly it was actually a hot topic during the creation of the Facebook 'like'. We know because the creator of the 'like' and ex-Facebook CTO Bret Taylor (currently CEO of mobile productivity app Quip), told us himself. But he also explained why there never was one, and probably never will be one: it's just far too complex. "[The dislike button] came up a lot. In fact even the language of the word like was something we discussed a lot as well. 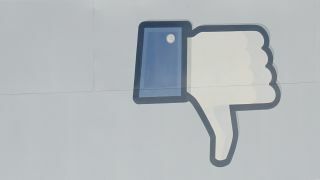 But regarding the dislike button, the main reason is that in the context of the social network, the negativity of that button has a lot of unfortunate consequences." "The reason we launched the button in the first place was that there were a lot of times that people wanted to acknowledge something someone did, but didn't have anything to say. And a lot of comments were one word like 'cool' or 'wow' so the like button let people did that with a single click. It wasn't really just a sentiment of 'like'." But a 'dislike' button wouldn't work in the same way, said Taylor, and would only bring a lot of negativity with it instead. There could be implications on cyber bullying, for example. "I have the feeling that if there were to be a 'dislike' button is that you would end up with these really negative social aspects to it. If you want to dislike something, you should probably write a comment, because there's probably a word for what you want to say. "I'm not saying the 'like' button isn't flawed would it be even more complex with a negative sentiment like 'dislike'." It's also worth mentioning that a 'dislike' button wouldn't be as useful as the 'like' for Facebook's targeted advertising, but that's just us being slightly cynical.